1. 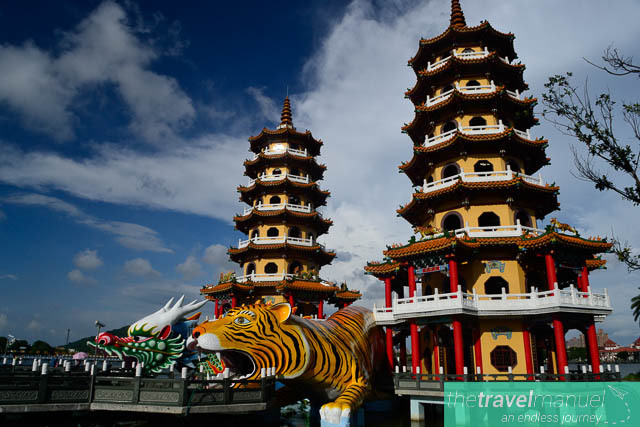 Dragon and Tiger Pagodas. 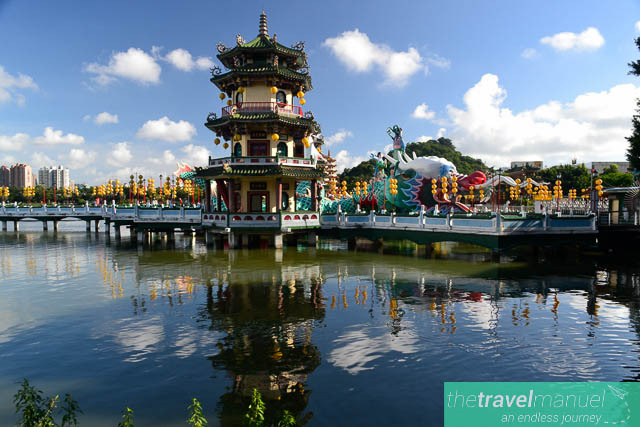 These pagodas can be found in the northern outskirts of Koahsiung on Lotus Lake. Entering through the Dragon’s throat and exiting through the Tiger’s mouth is symbolic of turning back luck into good fortune. Inside are paintings of heaven, hell and China’s 24 most obedient sons. There are also depictions of punishment of sins and all the art has been placed there to inspire people to do good deeds in their lifetime. 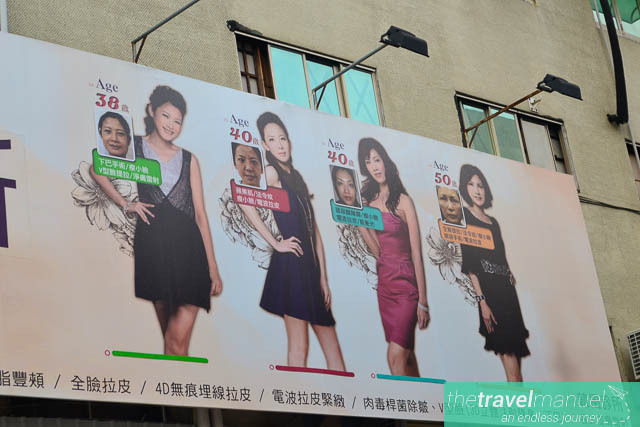 Plastic surgery especially alterations to the eyes, nose and face are quite common in Taiwan. Billboards advertise various procedures very openly through major cities. 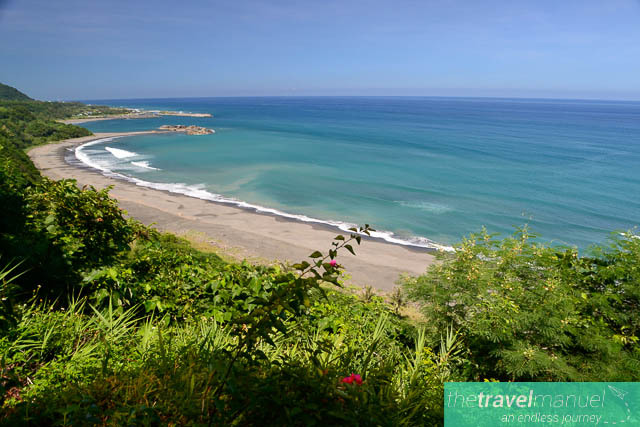 Not many people know this, but the Eastern coast of Taiwan is tropical and extremely picturesque. 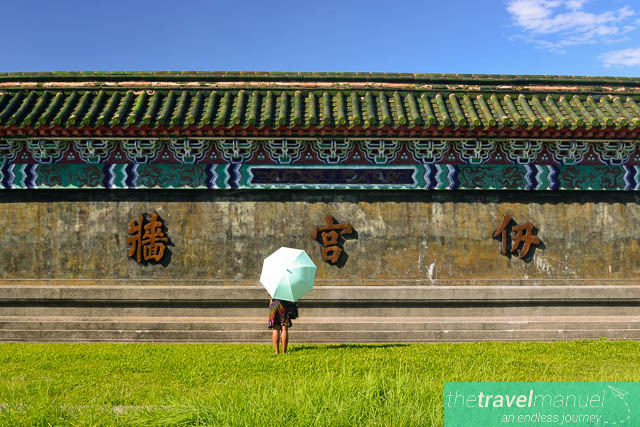 In the province of Taitung, lies a small coastal village known as Dulan. 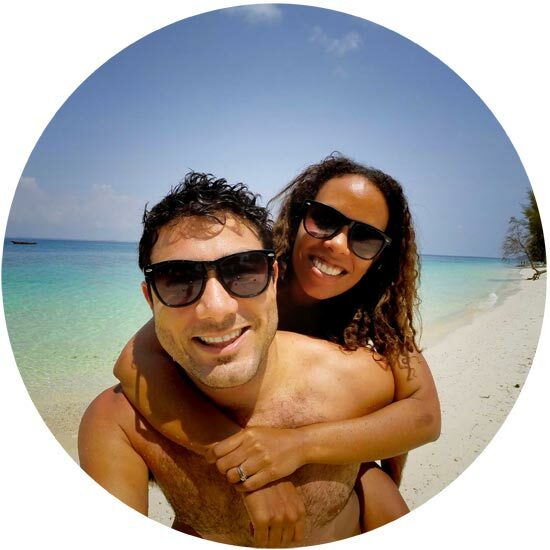 With a climate and vegetation very similar to that of Hawaii, we stumbled upon the most beautiful, rugged coastline home to palm trees, black sand beaches and warm water. 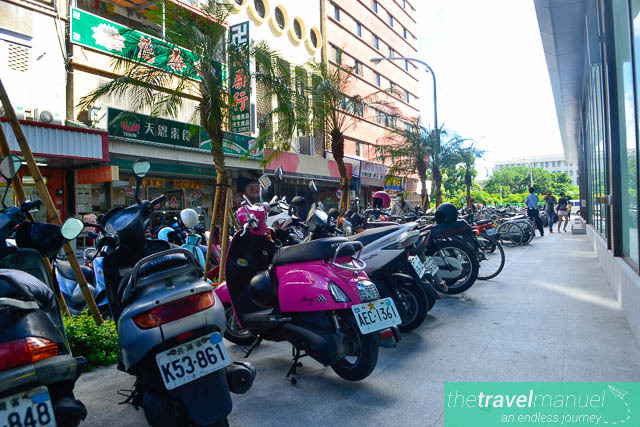 It is said that there are about 83 scooters to 100 residents in the cities near the Southern region of Taiwan. I can totally vouch for this as we saw way more scooters than cars. Drivers on the roads really seem to move safely around those on two wheels and most areas have a lane specifically for scooters. We happened to be in Taiwan during July and August which was Ghost Month. 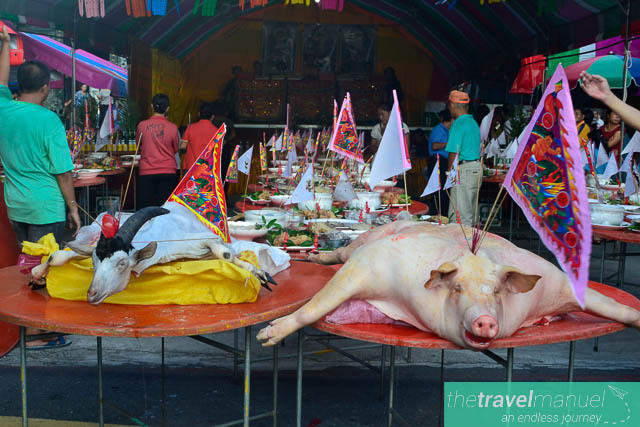 Unknown to us when we arrived, this Ghost Festival is celebrated by Chinese all around the world. Toaists and Buddhists believe that spirits, ghosts including those of their dead ancestors come out and visit the living. 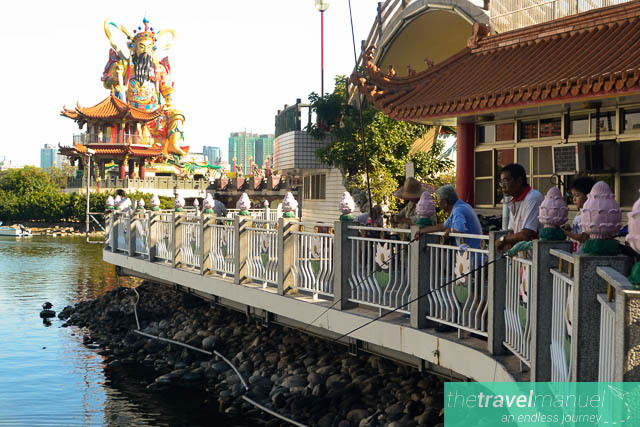 During this time, residents, shops and businesses all burn joss paper ( also known as ghost money) and offer food sacrifices to appease the ghosts and make sure they take the offerings and leave. Families with deceased members are also said to lay an extra seat at the table and prepare elaborate meals for them. Temperatures can reach up to 38 degrees Celius between June and August. At first we chuckled at locals using umbrellas in the centre of the city but had to buy our own the very next day when we feared heatstroke. 7. 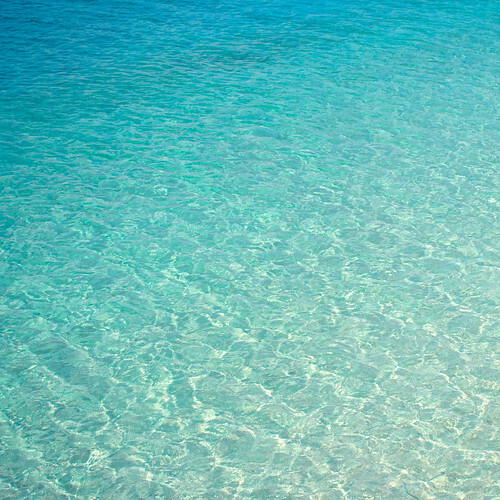 Beaches where no one swims. 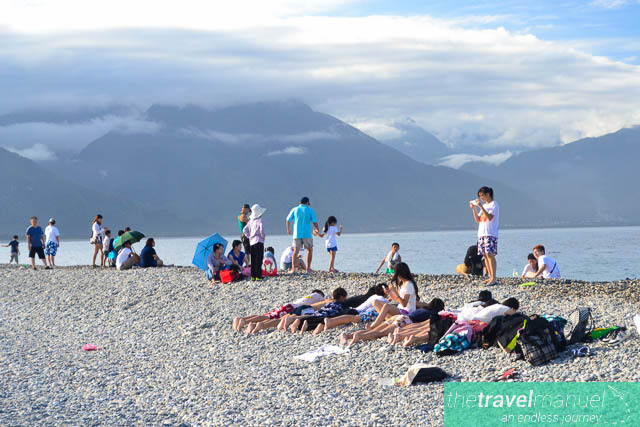 One of the most interesting beaches we visited was Qixingtan in Hualien on the North East coast. It’s a beach made of pebbles and rocks where no one is permitted to swim due to the strong currents and steep drop from the shore. 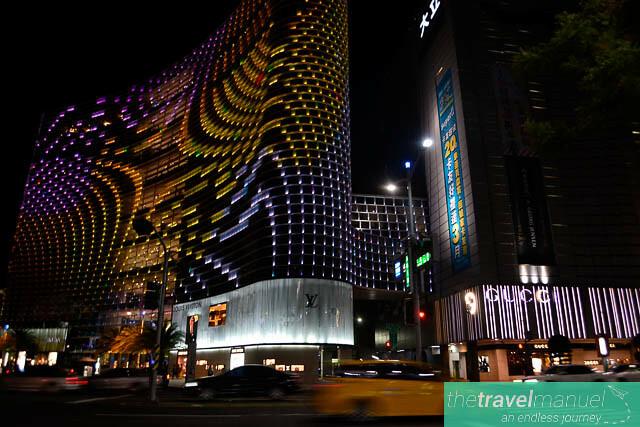 Kaohsiung is the second most populated area in Taiwan. It is well known for its shopping and aside from this Star Place Department store there are entire districts, streets and markets dedicated to delights shoppers such as Bridal Wear Street, Computer Street and the massive Dream Mall. 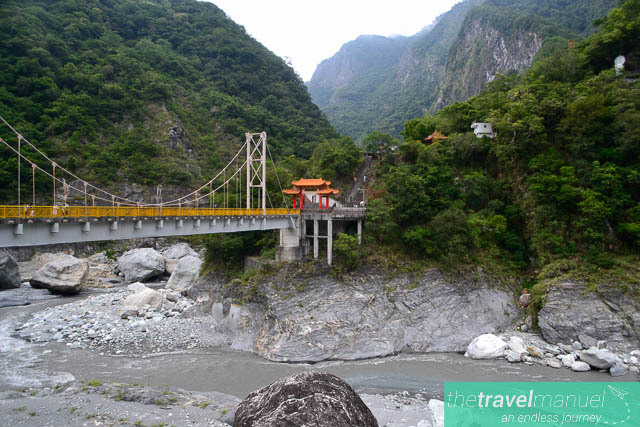 Tarako is one of eight National Parks in Taiwan. It’s filled with trails, hikes, temples and walks through tunnels, up steep rocky mountains and alongside the bluest rivers you’ve ever seen. 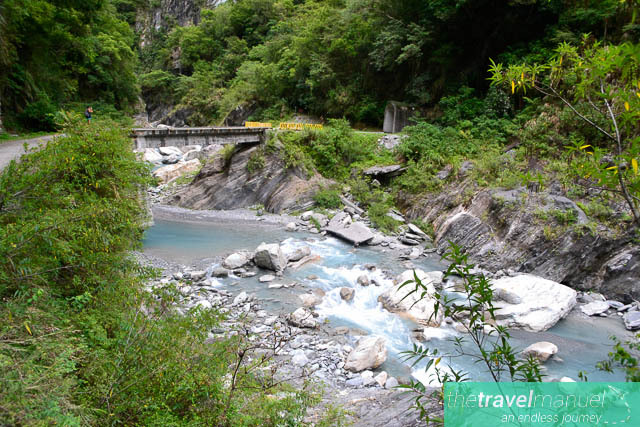 Taitung County on the East Coast has the largest collections of Aboriginal cultures such as Bunun, Paiwan, Rukai, Amis, Puyuma, Tao and Kavalan. 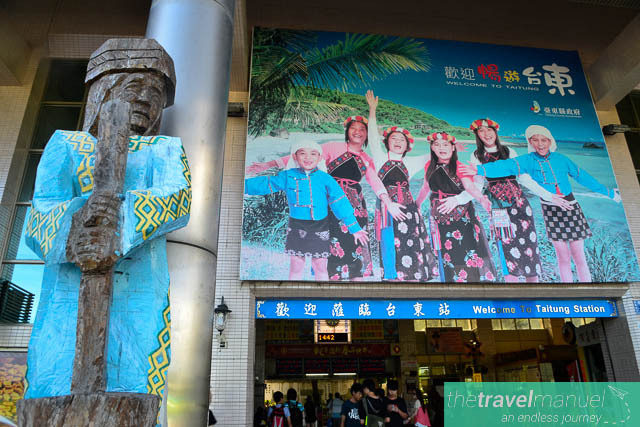 It was the least affected by Han Chinese colonization and therefore many aboriginal cultures still form a part of everyday life and they escaped most of the urbanization and pollution of the lowland areas. The most widely spoken language in Taiwan is Mandarin Chinese followed by Taiwanese Hokkien. 12. Gatekeeper at a Temple. 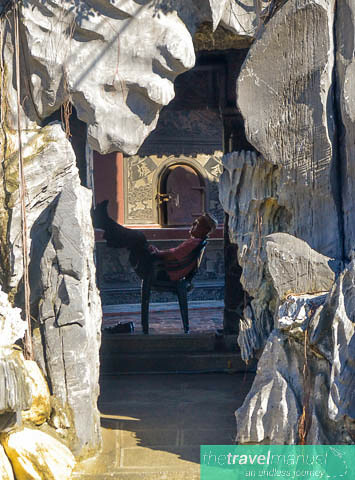 This caretaker or gatekeeper of the temple dozes off in the hot, summer sun. 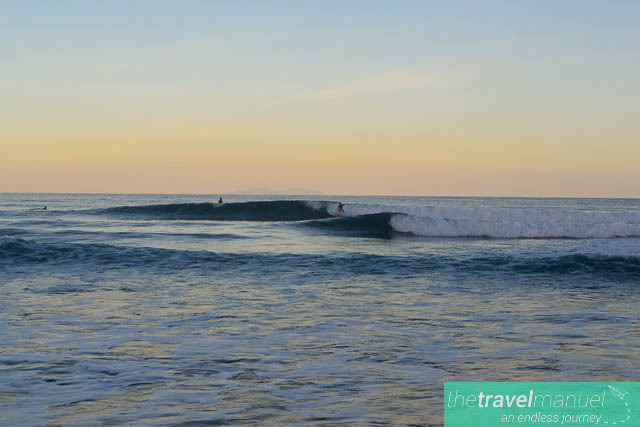 Our most surprising find of all: beautiful waves to surf in the warm waters of Taitung on Taiwan’s East Coast. 14. 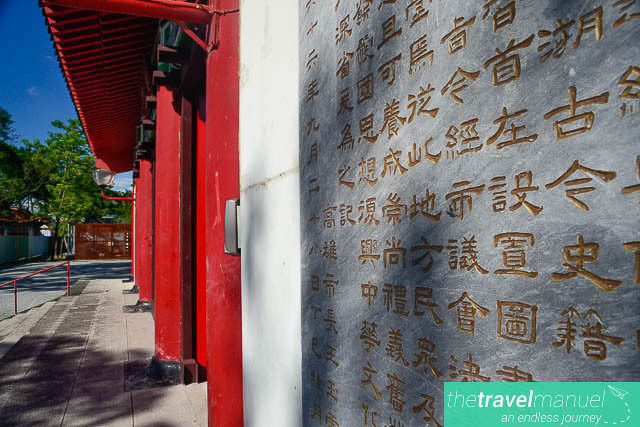 Confucius Temple at Lotus Lake. As the temple grounds were being renovated and cleaned, we snuck in through the temple doors to take a peek inside. 15. Fishermen at Pei Chi Pavilion. Local men fish off the Pei Chi Pavilion which leads to a statue of the Xuantian God. His sword is believed to be the first in the world. Even though tea is the popular hot beverage of Taiwan, we encountered a few great coffee shops selling espresso-based drinks. 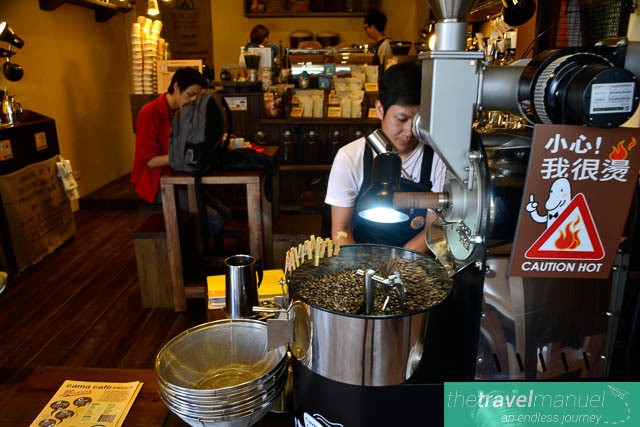 This was our favourite coffee shop in Pingtung where they regularly roasted beans in this machine. 17. Fruit and Vegetable vendors. 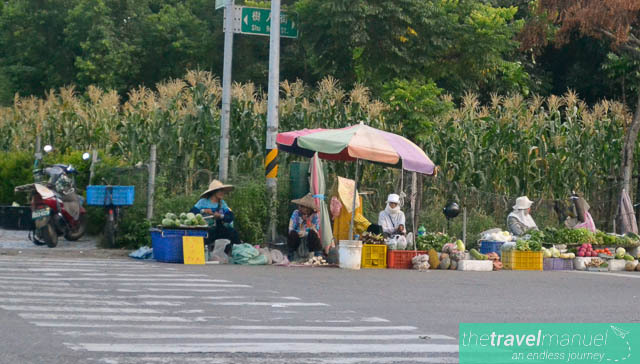 We passed this group of vegetable vendors on the side of the road. They hide from the sun’s strong rays in big hats and cloth revealing only their eyes. 18. Spring and Autumn Pavilions. 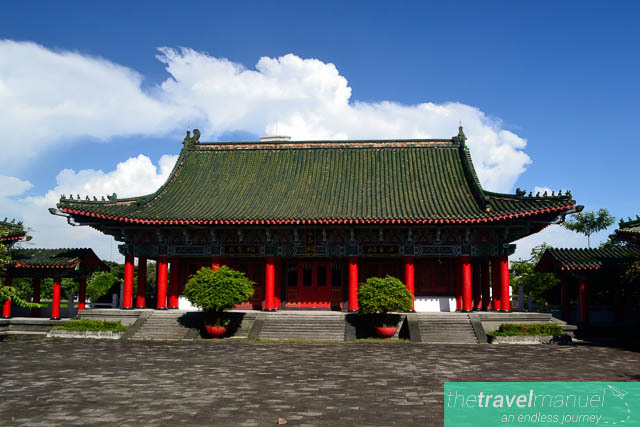 These two massive pavilions are dedicated to Kuan Kung, the God of War and completed in 1951. 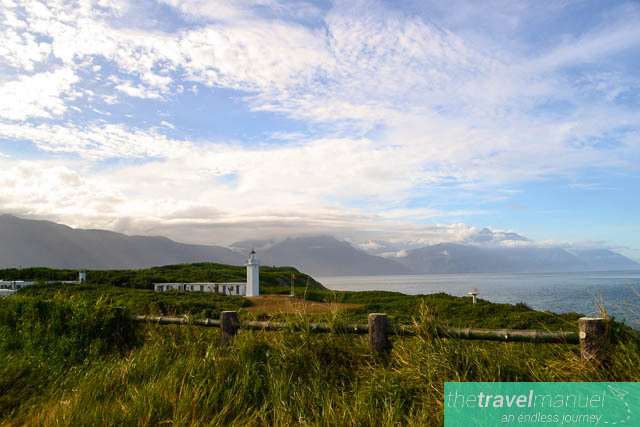 Cilaibi Lighthouse on the shores of Hulien on Taiwan’s East Coast. This was our incredible view from five star resort Silks Place Tarako. The river ran beneath the bridge leading up to a temple in the mountains.